Thread: yamaha 650 guys... i gotta question. ive been looking for a xs650 and i think i found one on the cheap. im new to jap bikes so the question is..
how can you tell a XJ650 from a XS650? XJ series are 4-cylinder, dohc, shaft-drive bikes. Made beginning in 1980 (I think.) Only thing they have in common with XS650 is the letter 'X'. If your bike is a '73 yamaha with a 650cc twin motor (that looks like workingman's pic), it is a TX650. Yamaha changed the model designation to TX for 1973-1974, then changed it back to XS for 1975. Essentially the same bike, though. 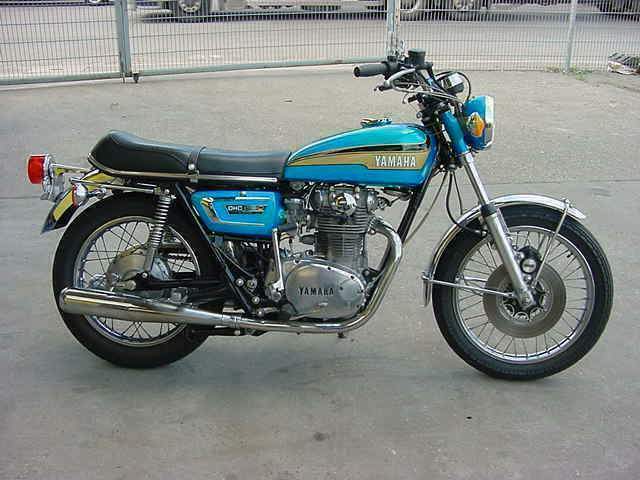 HOWEVER, a 1973 bike will have the early 256-type motor (used 1970-1973), not the later 447-type motor (1974-1984). There is no obvious difference between the two, but there is some incompatability in the engine internals. 256 uses a 22mm piston pin, 447 uses 20mm. 256 uses a 34 tooth cam sprocket with 4-bolt cam chain tensioner, 447 uses 36 tooth with 6-bolt tensioner, and different chain pitch. Parts for 256 motors can be harder to find, since way more 447s were made by the end of the XS650 production run in '84. Most engine hop-up parts like big bore kits and hot cams are made for 447 motors and will not fit a 1973 motor. weird it doesnt have any of those round plates at the top of the cyl. (sorry not being technical) the one i saw today... the 73...??650. those are just Valve covers mike. ya the one i saw today didnt have those. the shinny one in the middle is the pointes cover and the two in the front and back of the cylinder are the valve covers --- the one in the center could be diefferent --- on the bike your looking at --- are U sure its a twin? i just looked at a xs400 maybe they just didn't know what they had. ya it looked alot more like that, but the dude swore up and down it was a 650.... all the badging was scraped off so i had to take his word..
Don't all bikes have their displacement stamped into the lower side of the cylinder? Generally on the left side. The XS650 motor in my basement right now has "653cc" stamped on the front of the motor, at the bottom of the left jug.